The Quebec government has stepped way out of bounds, fully classifying and restricting vaping and e-cigarette use to parallel their smoking regulations. In no uncertain terms, this regulation will cause more people in Quebec to die from smoking related illnesses. Their extreme actions make vaping seem, to those who are not informed, to be as high risk to health as smoking cigarettes. The Quebec government is attempting to ‘protect’ the citizens of Quebec from something that could save tens of thousands of lives in Quebec, providing them with a much safer alternative to smoking cigarettes. This is a travesty, and my hope is that the vaping community will rally up and fight against this bill. The further implications of this bill could soon reach other provinces, as several have taken a ‘wait and see’ approach. Anti-smoking groups hailed Quebec’s new tobacco-control law Friday as a world precedent. “We’re thrilled,” said Flory Doucas, co-director of the Quebec Coalition for Tobacco Control. “The minister (for Rehabilitation, Youth Protection and Public Health, Lucie) Charlebois delivered,” Doucas said. Bill 44, first introduced in May, places limits on electronic cigarettes and smoking in public places, including outdoor café terrasses. It received unanimous support in the National Assembly. Under the law, smoking on the outdoor terrasses of Montreal bars and restaurants will be prohibited — despite bar owners protesting this will cut down on business. Doucas said the bill sets a world precedent in setting a minimum size for cigarette packages, thus preventing manufacturers from producing small, slim packs resembling a lipstick or iPod. The smaller packs allowed manufacturers to shrink the size of health warnings which must cover 75 per cent of the front and back of cigarette packs under federal law, Doucas said. “Packaging was becoming smaller and smaller,” she said. Doucas also praised the government for banning flavoured cigarettes like menthol or cherry-flavoured smokes, which are popular with young smokers. 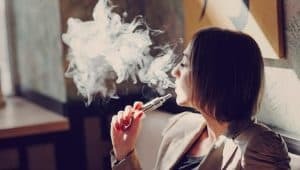 The law also means that smoking e-cigarettes, commonly known as vaping, will be banned in the same locations as traditional cigarettes, and the selling of flavoured cartridges is forbidden. The sale to minors is also prohibited. Doucas said the government took a balanced approach to e-cigarettes, which some studies suggest could be helpful in aiding smokers kick the habit, while other experts warn they are a gateway to smoking among youth. “They’re still available but we don’t make them attractive to youth,” she said. The new legislation also makes it illegal to smoke in a vehicle when a child under 16 is present. It also bans smoking at exterior playgrounds and sports fields used by kids. Smoking is also prohibited on the grounds of all schools, as well as daycares, adult education centres and professional training centres. Advertising of tobacco products is also further restricted under the new law, and new sanctions are in place for those who sell tobacco products to minors or for adults who purchase tobacco for minors. The amount for fines has also been increased. “The law adopted (Thursday) contains ambitious measures that will allow Quebec to become a world leader in the fight against tobacco,” Charlebois said in a statement. The Canadian Cancer Society reacted favourably to the new legislation. Canadian Vaping Association’s challenge of prohibition of vaping in Quebec.